The answer to this question depends a lot on the thousand words in question. If the words are describing something visible, like a landscape, you could probably squeeze even more than a thousand words into a good image. However, what do you do when the image has to convey abstract stuff like ideas, thoughts, or feelings? Well, you fail miserably, that's what you do. To be fair, there are exceptions to this rule. We call them "masterpieces of art", though, and Gavin Hood's take on "Ender's Game" is by no means a masterpiece of anything. Well, except said failure, I guess. If you haven't read the novel, the movie goes too damn fast, it makes no sense at all, and you don't like it in the end. It's simply too short to scratch the surface of the novel, and even if it were a couple of weeks long to encompass everything that was cut out, a whole lot of the novel is going on in the characters' heads in the form of ideas, thoughts, and feelings. Not a very filmable environment, that. And if you have read the novel... The movie goes too damn fast, you realize it makes no sense at all, and you don't like it in the end, for essentially the same reasons. It tries hard to be true to the novel. The cast is well chosen, with the exception of Bernard (what, no French accent, wtf?). Unfortunately, it's all moot. There are few characters with any significant screen time, and they do their jobs fine, but the rest could have just as easily been wallpapers. And there's way too much of Bernard. 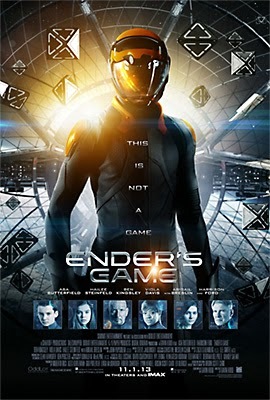 Some visuals are spot-on, Ender's scene with the giant in the mind game in particular. Others, not so much. I have a personal gripe with how movies depict space. Why the hell is it always so tiny and jammed with stuff? It really is neither. The technology used, such as the space station, the mid-air touchscreen displays, and even the space ships, looks a good deal more advanced than I remember from the book, but I guess that's fine, considering the current pace of development. It certainly doesn't contradict the story. In the end, it is the story that is the biggest problem with the movie, not the visuals. The main events are there, but pretty much everything significant for the background of those events has been either abridged out of existence or simply left unexplained, turning the movie into an incoherent mess. I hate to be on the reading-crowd-hating-movies-based-on-books bandwagon, but... I am. If you have not read the novel, do it, then skip watching this movie. This way, you will be spared the disappointment, and as a bonus, you'll have read a good book.